Recently someone asked me about my choice of Twitter client on Android: why had I chosen the Twidroyd app over the official client from Twitter? 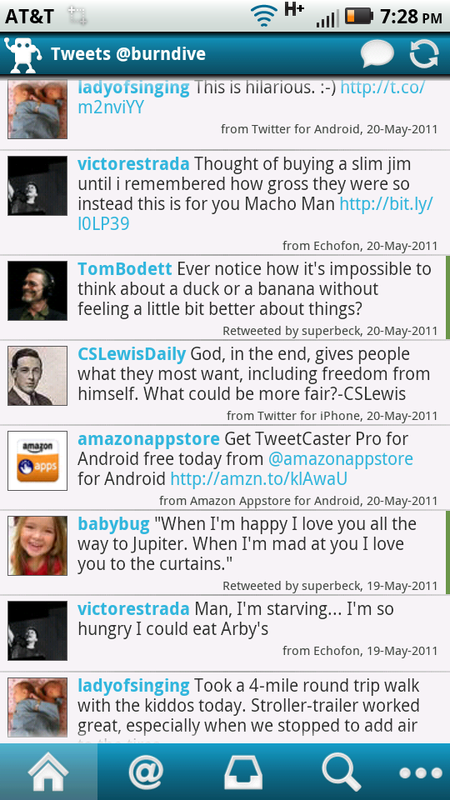 At the time I had also just downloaded, and was trying out the TweetCaster Pro app. 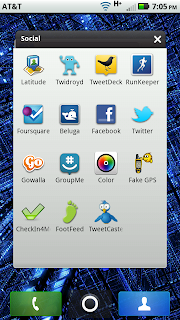 I have been meaning to do a series of posts about various categories of Android apps. Hopefully this will be the first such post. My goal is to be helpful to others who are curious about what apps are out there, but aren't as adventurous as I am in trying them all. Come on in, by the way, the water's fine. 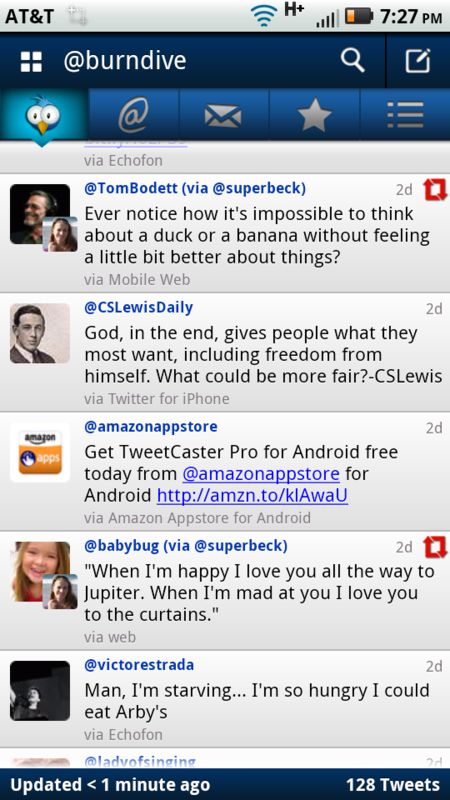 The first thing that attracted me to the Twidroyd app was the Posterous Twitter help page, which basically says that if you want to use a Twitter app on Android that integrates Posterous, Twidroyd is your only option. I have been using Posterous to post pictures, video, and occasionally long-form text from my phone since before I had a smartphone, and I'm still very happy with it. 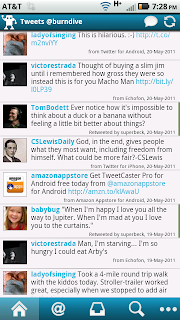 As such, Posterous integration was a good selling point for an Android Twitter app. I also at the time downloaded the official Twitter app, as well as TweetDeck, but I didn't find either of them to be particularly compelling. I should mention that, while Twidroyd is the only Twitter app that integrates Posterous, there is also an official Posterous app, which generates posts that can be auto-posted to Twitter. This is the way that I end up sending most of my Posterous posts. The only advantage of using Twidroyd is if I wanted to create a Posterous post, but post it to Twitter with text that is different from just the title of the post. It also works with multiple Twitter accounts, though I only have one. Twidroyd lets you customize its notifications in just about every possible way. One nice feature that other clients don't have is that it displays the tweet text in the notification bar. This is something that I'm finding I miss when trying out other clients. Speaking of other clients, Amazon recently gave away the Premium version of TweetCaster as their free app of the day, so I downloaded it and gave it a try. The first thing that struck me was that it was very visually appealing. And not only does it look good, the interface is very functional! Tweets by me, replies, and mentions, are all highlighted in different color gradient backgrounds. Favorites and retweets are marked with intuitive icons. Tweets by me have the icon on the opposite side, and for retweets, the retweeter's icon is superimposed on the bottom corner of the original author's icon. Looking at the settings, all of these things are customizable as well. The jury is still out on whether I'm going to switch to TweetCaster. The way the interface graphically communicates so much information is appealing. I can post photos and video directly to Posterous, and I have yet to post a Bit.ly-shortened URL link from my phone. If I have more than 140 characters to post, I can just use Posterous instead of Twidroyd's integrated text shortening features. 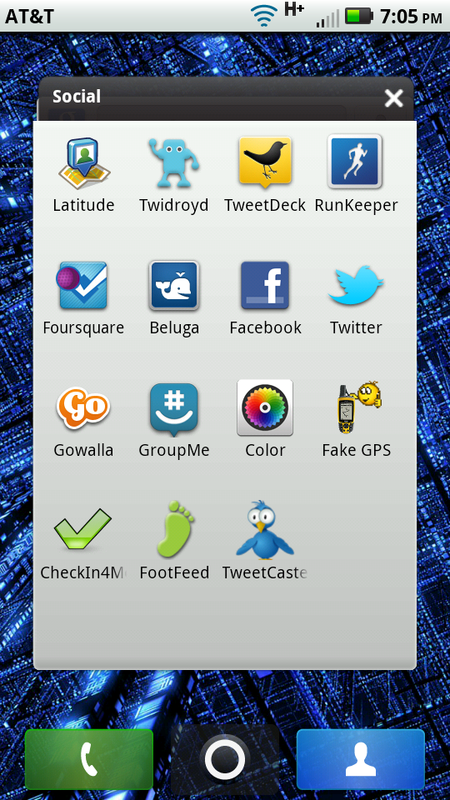 What it comes down to for me is Twidroyd's notification previews vs. TweetCaster's pretty and functional interface. For now I'm using both.